Like a bird on a wire: falcons such as peregrines and merlins (shown here) will travel and seek out prey in both rural environments and urban ones - sometimes nesting there as well. The next time you're downtown near the bayfront, look up at the smokestack remaining from the old Penelec substation situated by the Maritime Museum and the Blasco Library. If you see a small dark blob rising up from the rim or perched on the catwalk, what you are probably looking at is a peregrine falcon. While many are familiar with conspicuous birds that are a daily sight such as American robins, blue jays, black-capped chickadees, house sparrows, mourning doves and more, the impression remains that to see the unusual or "exotic" birds, one has to go somewhere else, out in the country or into the woods. The way some news stories about unknown birds are reported — as rare out-of-place wild creatures coming into human space for a little while — continues to perpetrate the notion of them as oddities, kinks in the usual division between nature and us. The fact that peregrines have been around for nearly a decade now proves this is not true. As avian life goes, Erie is a paradise. 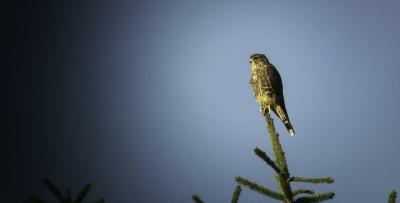 Besides the peregrines, other birds of prey live here year-round. 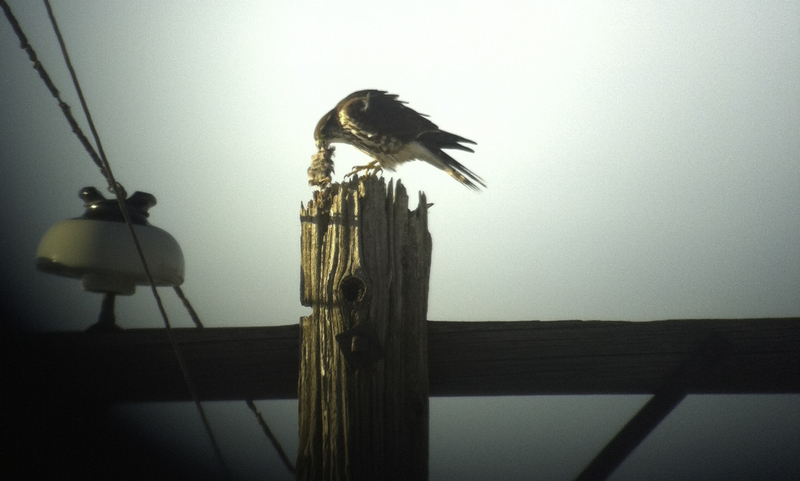 Many merlins (a type of small falcon) now make their home in Erie and are breeding here as well. The first nest with two fledglings was confirmed in 2014. Bald eagles, too, are seen regularly over the bay and have been recorded near 12th and Pittsburgh, in the air over the Peach Street Wegmans, and flying over city neighborhoods. Screech and barred owls are regular residents wherever a good stand of evergreens support them. 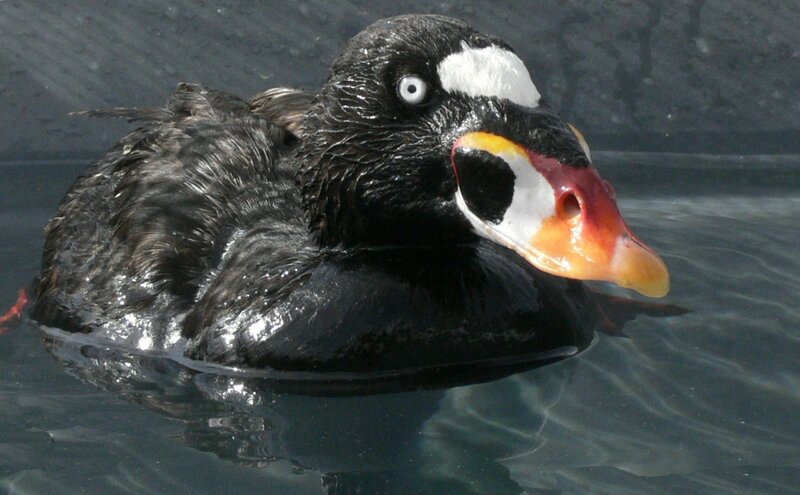 A regular visitor to Presque Isle Bay, the male surf scoter is identified by its black plumage and striking facial features, including its uniquely shaped bill and white markings. Erie also sees an enormous variety of birds passing through on migration. Because of Erie's location on what's called the Eastern Flyway — an aerial superhighway birds use to migrate north and south — hundreds of thousands if not millions of birds can pass through here in the spring and fall each year. Many stop at Presque Isle State Park, but many others land in backyards, in parks and on the bayfront. Right now, waterfowl are already beginning their northern trip. On any given day, in open water on the bay you might find the likes of surf scoters, goldeneye, greater and lesser scaup, canvasbacks, redheads, buffleheads, three types of mergansers, two types of grebes, and common loons. The endangered Piping Plover makes its way back to Erie after a 50 year absence. But why do birds like cities? Urban environments can offer great food resources. Train corridors make good open hunting grounds for rodents and small birds, the bay for fish. Those pigeons downtown make a splendid buffet for bird-eating raptors like peregrines that haunt the downtown area along with the bayfront. One of their favorite perches in the city is the Renaissance Building where feathers and feet can be found on the window ledges. How they made it to the window ledges of downtowns everywhere is a story in itself. All peregrine falcons living east of the Mississippi River are the descendants of a re-population effort after the insecticide DDT decimated the population. Like the bald eagle and other birds of prey, falcon numbers plummeted and, in fact, the eastern population of the bird was considered extirpated, or extinct. The greatest success in re-establishing the endangered bird came in the form of introducing young birds to the tops of city buildings where fewer predators existed. Their traditional cliff-top aeries posed too many risks for young birds without adults around for protection. As the population grew, the urban-based peregrine became the norm, though traditional cliff-side aeries are being used again as well. In nearby cities, peregrines choose the ledges under bridges, too. The first bird to establish territory in Erie was reared on a noisy bridge in Cleveland, so when it chose inside the 160-foot tall dry dock building at Don Jon Shipbuilding and Repair for a nesting site, the place probably felt like home to him despite the high decibels of that industrial setting. Soon, if you keep your eyes to the sky, you might actually see two peregrines flying above the bayfront as courtship begins. The pair uses the smokestack as a launching platform for the dramatic aerial displays they perform before nesting. The breathtaking ritual includes flying closely together with numerous dips, rolls, twists, turns, and sharp dives. And in April, they'll start scouting inside the Don Jon building for a place to make their nesting site, which is not woven sticks and branches as we imagine for most birds. In natural settings and in nest boxes on city building, the "nest" is just a depression in gravel substrate. What the Erie peregrines use or how they design their site is not known, as the spaces they have used over the past years have never been examined due to their height of ledges they choose. Sometime in June, new peregrines may be ready to test their wings. If you want to see them or any other interesting birds, all you have to do is look up.